Say yes to the dress and get ready for your big fat whatever wedding, ‘cause as they say, the more the merrier. Big weddings are the bomb, but often they can leave the bride and groom feeling bombed out. These days, people are getting married later in life, and a massive wedding often seems inappropriate past a certain age. 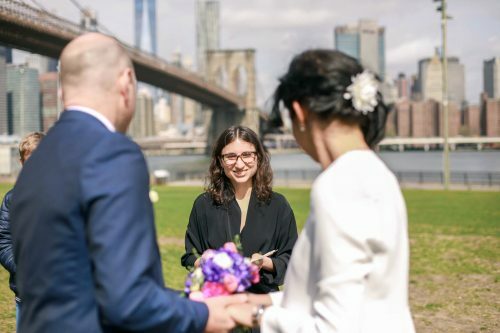 Plus, many Brooklynites have a desire to elope, and keep things simple by inviting only a couple key people for a brief and intimate celebration. Living in New York is hectic enough, so let’s not make this too complicated, right? Also, wouldn’t it be nice to save your nest egg for oh, I don’t know… New York real estate? A trip around the world? A lifetime supply of La Croix? 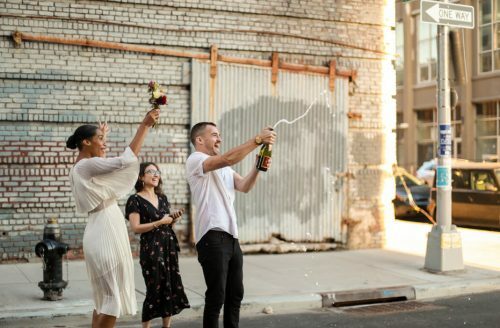 More than a year ago local photographer Johnny Cirillo and his friend, officiant and planner Grace Steite started talking about the world of weddings, and realized that no one in Brooklyn was tuned in to the small wedding phenomenon—people were having the kind of low-key weddings that seem naturally suited to a neighborhood like Greenpoint, but no one was helping plan them. And so, Bodega Weddings was born. The pair focus on elopements and small weddings under 30 people (occasionally up to 50 on request), and “swoop in, get the romance of it, and then it’s over,” Cirillo says. A typical wedding for them is less than ten people in a local park (often McGolrick or Transmitter), officiated by Grace without a microphone, with a relaxed group of friends and loved ones, and the whole thing takes an hour or less. Johnny shoots the event, and his pictures poetically telegraph the intimate nature of the event, and never feel staged. He flawlessly captures the innate beauty in real New York moments. In addition to officiating as a non-denominational minister, Grace helps with planning, whether people want to wing it outdoors or use her to help coordinate to book a cozy space for the ceremony or the after party at a bar. With smaller weddings, “You can see how happy you make people,” Grace says. Both of them relish in making real human connections in a smaller group, and helping people share that experience. They both add that these less formal yet cherished moments feels like hanging out with people you’ve known forever. And that often, the couples ask them to hang out afterward, even if they’ve never met before. Where did the name of their company come from? Johnny is a native New Yorker, having lived in Greenpoint for 14 years, and Grace has lived in Greenpoint for six years. To them, the term “bodega” is a neighborhood place where everyone is welcome, a one stop shop for convenience. Bodegas can also be the heart and soul of a neighborhood. 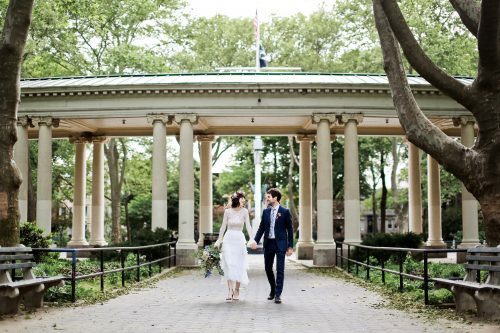 And in a place like Greenpoint, small weddings are the ideal way to share your heart and soul with your closest. “The ones in Greenpoint are the best,” says Johnny. But, he adds, they will travel as far as the Catskills for your nuptials.